El Rey can still be saved! CHICO, CA – The El Rey Theater, long thought to be doomed to become future office space, has recently been put back up for sale. Beautiful fairy murals, painted in 1948 in the Art Nouveau style, are still able to be restored, and the theater has great potential for restoration and a return to its former use. We need volunteers to form a group to save this incredible treasure. This second chance may be our last! Interested parties should contact Laura Urseny at the Chico Enterprise Record, 530 891-1234. Is there a price or a link to the for sale page? Anyone have a larger picture of the auditorium? 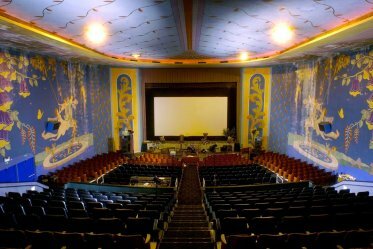 This theater looks like our theater in Norwalk Ohio. It sadly is up for sale again. It is a Schine theater built in 1941 Greek Deco Style I believe designed by Eberson? Good luck I hope you can save it!